Super Cup 2018: East Bengal Ride On Dudu Omegbemi’s Strike Against FC Goa To Enter The Final: Hello, Everyone Today I am going to share some exciting facts on the Super Cup 2018 East Bengal ride on Dudu Omegbemi’s strike against FC Goa to enter the final. Dudu Omegbemi struck the match’s only goal as East Bengal recorded a 1-0 win over FC Goa to make the final of the inaugural Super Cup in Bhubaneswar on Monday. After a goalless first half, the Nigerian striker Dudu breaks the deadlock in the 78th minute at Kalinga Stadium. East Bengal now awaits the winners of the second semi-final between Mohun Bagan and Bengaluru FC. The Kolkata side’s coach Khalid Jamil went in with a 4-5-1 combination with Dudu the lone striker upfront and Ugandan Khalid Aucho getting his first start in midfield. FC Goa’s coach Derick Pereira fielded a 4-4-2 with Manvir Singh partnering Spaniard Ferran Corominas in the attack. It was a scrappy first-half which ended goallessly. The East Bengal has the better chances with a Syrian midfielder Mahmoud Al Amna missing the first real chance in 19th minute when he fails to tap in a cross from inside the box by the Japanese midfielder Katsumi Yusa. Dudu broke free from an Al Amna flicked header a minute later but with just the Goa keeper Kattimani to beat hit straight at him. Katsumi then missed two gilt-edging chances between the 33rd and 35th minutes and Goa got their best chance through Corominas in adding time, when his solo run found him in front of the East Bengal goalie Ubaid, but he cannot converts. The half is highlighting as many as four bookings, equally shared by both sides. Seriton and Edu Bedia went into referee Santhosh Bhaskaran’s book for Goa while Cavin Lobo and Gurwinder Singh received yellow cards for East Bengal. The Kolkata team continued to press hard for a goal in the second half, and Dudu and Katsumi missed at least three golden opportunities to score between them, the Nigerian the more profligating. The deadlock is finally broken when another quality cross from the left flank by Katsumi found Dudu, who is tapping in the past Kattimani. 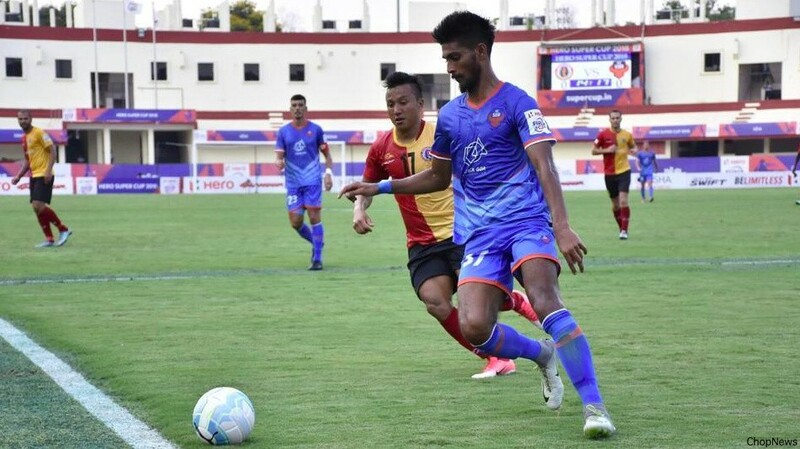 While Samad Ali Mallik became the third East Bengal player to be booked, FC Goa captain Bedia pick up his second yellow of the game for a lunge at substitute Kromah, who has come in for Dudu and Goa has to finish the game with the 10-men. So, these are the points to describe on the Super Cup 2018 East Bengal ride on Dudu Omegbemi’s strike against FC Goa to enter the final.